Some people come to New Zealand to walk through the scenery. I came to drive through it. If you love travelling with your own vehicle, whether car or bike, you might understand how much fun I had with ten hours of twisting roads through great scenery and almost no traffic. 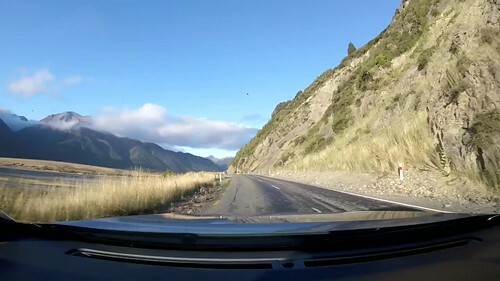 New Zealand is definitely top ten for road-tripping. Bottom end of top ten, but still top ten. Maybe you’d have to love doing it as much as I do, and to have done it all around the world, to really appreciate how good it is, or just go and do it for yourself if you love driving. The video above is just a couple of minutes in one place out of ten hours and hundreds of miles, but maybe it gives you a taste. Annoying alignment of windscreen dirt and camera, but great alignment of road and radio (you’ll have to turn it up, it’s just the camera picking up the radio, not a proper audio track). Click to play, and if the overlay graphic stays on, just touch the screen outside the video. The scenery is much better than a crappy camera can show. An open road, great views, and a fast-ish car… That’s where I find my heaven.